Boxing Day is always a big day for sport with a full schedule of football & high quality horse racing, we're taking a look at one Premier League game plus a couple of Grade One races from Kempton as we look for some festive cheer. This year's renewal of the Christmas Hurdle looks to be one where last year's novices try to make their mark as fully fledged Champion Hurdle contenders & we think it'll certainly be one of the upstarts to win this time. Punjabi is a previous Champion Hurdler but that was in 2009 & Henderson's charge has been off the track for two & a half years & we can't see him showing up well & Raya Star & Get Me Out Of Here are top handicappers but probably not quite at this level whilst Moose Moran is a no hoper. After eliminating horses 5-8 from consideration we're left with the 4 & 5 year olds, Dodging Bullets has shown good form this season to win twice after competing at a very high level & running well in its first 3 hurdle starts at the beginning of 2012 but opposition here might just have the edge as he's twice finished behind Countrywide Flame already. Cinders And Ashes & Darlan finished 1st & 2nd respectively in the Supreme Novices at Cheltenham & Darlan then went & won very easily at Aintree in a Grade Two but it does have to overcome this being its first start of the season. Donald McCain's Cinders And Ashes one fair & square at Cheltenham but Darlan may just have a little more scope in the long run & either way it seems hard to imagine that Cinders And Ashes can turn around form with Countrywide Flame as John Quinn's 4 year old slammed it by 12 lengths in the Fighting Fifth at Newcastle. Countrywide Flame had been kept busy over the summer by running on the flat but gave the impression that he'd grown up a bit in that Newcastle race & he'd already shown great from last year when winning the Triumph & coming close to following up at Aintree, we're certain if Countrywide Flame was with a more fashionable trainer it'd be a shorter price than 2/1 for this so take advantage & get on. The 2nd most prestigious 3 mile chase of the season nearly always throws up classy winners & is the key trial for the Gold Cup, we won't have 5 time winner Kauto Star competing this time but 2010 winner & 2011 runner up Long Run heads the betting at 2/1. Long Run is the obvious starting point as the highest rated horse & we felt he'd regain the Gold Cup last March but it might be that the 2010 race took a lot of the horse as he did that as just a 6 year old, many ex-French horses show great form as younger horses over here but then fail to improve like more patiently trained runners. Long Run has only won once in his last 5 runs & that was all out holding off Burton Port, the form is all high class but the odds today are a little short especially as owner & amateur rider Sam Waley-Cohen continues to take the reins - he of course can do as he pleases but stable jockey Barry Geraghty would surely do a better job. Long Run's stablemate Riverside Theatre looks to hold a great chance even though it's know as a two & a half miler as it looked like a real staying performance when winning the Ryanair at Cheltenham & he's repeatedly shone after a break. Kauto Stone however looks to be too short a price based on overall form although the win at Down Royal in November was the best it had been & may have indicated a step up, we still can't be backing the Nicholls horse in this one. The Giant Bolster is one that definitely has improved, finishing 2nd in the Gold Cup & then 3rd in the Betfair Chase but nthat still isn;t winning form & while it could run well is another we'll disregard. Grands Crus is the horse we fear most as he'd looked a true 3 mile star as a novice up until disappointing at Cheltenham, he flopped on comeback when red hot favourite for the Paddy Power but the money has started to come for David Pipe's grey in recent days & this track should be perfect for him if on his game. We're instead siding with Cue Card as the youngest horse in the race looks to take it's classy form over a shorter distance & become a serious Gold Cup contender. Colin Tizzard's 6 year old unseated when taking on Grands Crus on its 2nd chase start but other than that has either won or when losing has only done so to the very best novices around in Bob's Worth & the spectacular Sprinter Sacre. 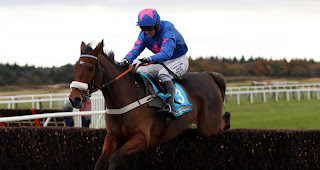 Cue Card tore up trees when storming to victory in the Haldon Gold Cup at Exeter & we're unsure this will be a truly run race as many of the contenders are speed horses, if the race is run to suit we feel Cue Card will be the quickest come the end & can claim a brilliant success at odds of 11/2. Martin Jol's Fulham have won just once in their last 10 league games & come up against Southampton who are in relatively good form winning half their last 6 & their defence has improved massively to only concede just 5 in 7 after looking completely hopeless until the end of October, this promises to be an intriguing match up. Everybody knows that Fulham's away form is less than adequate but they're pretty solid at home usually & although they've lost 3 at home from 8 two of those came against top opposition in the form of Spurs & Man City. Fulham seem to have adopted a very attacking attitude with Jol now really molding the side to his style & the signing of Dimitar Berbatov looks an inspired piece of business, he's known to bully weaker teams & Southampton have conceded 20 in 7 away games even with their recent improvement. At the back Fulham look a bit of an ageing side & Schwarzer has been on the slide for a while & all 4 first choice defenders 30 or older & they're the 2nd highest conceders along with Southampton & Wigan. They were awful against Liverpool at the weekend, offering very little resistance but the Saints could be the right opponents for them to be facing here. Southampton may be improved recently but that has mainly been at St Marys as they've won only once on the road & lost their other 6 games, their recent defensive improvement has also come at a cost to their attacking threat & star striker Rickie Lambert has scored just twice in 12. Of great concern to Southampton will be the injury to their captain & playmaker Adam Lallana who looks likely to sit this one out, he's very important to them but at least Gaston Ramirez has got fit & started to contribute, he adds a touch of class when on form. Southampton went down 1-0 at home to Sunderland on Saturday & only managed 2 shots on target in the game, Rickie Lambert will find defences more to his liking than Fulham's, they're a physical bunch, & he's struggled to get good service in recent games anyway. We're unconvinced Southampton can keep up their good defensive work & Fulham can take advantage in a game they need to win to get their season back on track, back them at a shades of odds on to win the game. Leeds lighting the way back to the big time?